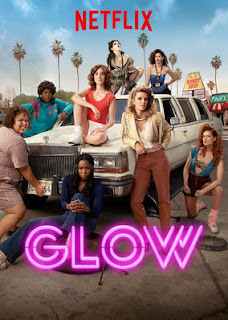 The first season of GLOW was a surprisingly delight as it proved to be not only a comedic take on the already entertaining wrestling variety show, but they also crafted some excellent stories of women to tell. On the surface it may seem easy to dismiss all of this as silly, but the writers of the show developed some great narratives tied to a rich set of characters. The second season continues the journey of the first-ever women's professional wrestling show and the women involved. And you know that when you have a group of strong-willed individuals kept together for extended periods of time, inevitable classes and complications will follow. I really enjoy this show as there's nothing quite like it on television today. More than being somewhat empowering for women given its casting, but it's a unique perspective with stories that are quite different from what we've encountered in other shows before this. And that's a good thing. Synopsis: GLOW is an American comedy series created by Liz Flahive and Carly Mensch. The show's first season has received a number of awards nominations including the Emmy for Outstanding Comedy series. As the girls begin to resume shooting the show, the discover that Cherry (Sydelle Noel) has been replaced as Junkchain by a woman named Yolanda (), which does leave the gcrew a little unsettled. At the same time Sam (Marc Maron) and Bash (Chris Lowell) put forward new contracts for all the girls to sign, further increasing tensions. But Ruth (Alison Brie) tries to keep spirits up by getting cameraman Russell to shoot a opening title sequence for the show at the local mall. Meanwhile Debbie (Betty Gilpin) is determined to get a better position for herself with respect to the show and negotiates a producer role given her more extensive television experience and her value to the show. It's not something that sits well with Sam but what else can he do as Debbie had gone over his head. This season also has more of a role for Justine (Britt Baron), Sam's daughter, as he tries to figure out how to be a father to the daughter he never got to raise until now. What I Liked: This second season was totally bonkers as the girls continue to push the value of more compelling narratives for their characters. We have characters turning into new characters and a more complicated yet almost cartoony villain plot for Zoya that somehow includes the kidnapping of Liberty Belle's daughter? And this season gives fans what they've wanted since day one - an entire episode shot as if the actual GLOW show. They really had a lot of fun with this season. Alison Brie gives a complicated and brilliant performance throughout the show and she is a give to this production. It helps that her character arc is also quite fulfilling with its own share of twists and turns and equally great characters to perform with. We also saw more depth for characters like Tammé "The Welfare Queen" Dawson (Kia Stevens) given her family life and even the somewhat somber depiction of Cherry's effort to be a more traditional actress. What Could Have Been Better: Not every character could get rich development in this show, which is inevitable for an ensemble of this size. And thus I was left a little wanting in terms of having more character time for the likes of Carmen "Machu Picchu" Wade (Britney Young), who has to be a fan favorite. And I totally want to know more about Sheila "the She Wolf" (Gayle Rankin) given her character's highly antisocial personality. But we get what we can. Bash's story arc is a little all over the place as we have his efforts to help the show and then the sudden shift to his personal life and relationships. It had a fair amount of runtime but I felt it wasn't quite the best written parts of the show and that made it stand out for the wrong reasons, at least for me. It wasn't terrible but it was a little less awesome than the others. TL;DR: GLOW continues to be an amazing show that is richly entertaining on so many levels. This second season really pushes the character development in great new ways and I loved every bit of it. Thus the season gets a full 5 new wrestling moves the girls learn out of a possible 5.